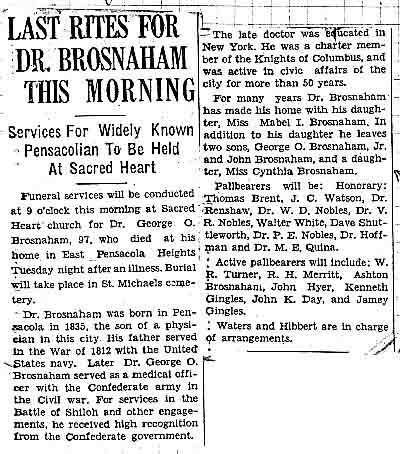 Dr. George O. Brosnaham was the youngest child of Dr. John Brosnahan and Isabella Eugenia Sierra. His wife, Cynthia McKee Gingles died in 1895, nearly forty years earlier. Both are buried at St. Michael's Cemetery in Pensacola. George, age 97, served as a surgeon in the Confederacy. He is survived by his only daughter, Mabel, or Maybelle, and two sons, George and John, as well as a granddaughter [not daughter], Cynthia Brosnahan, daughter of his son George. 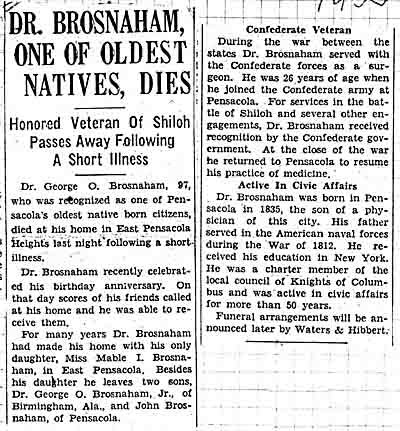 Copies of these two obituaries were sent to me by Cynthia Brosnahan Richardson, George's granddaughter, mentioned in the second obituary.